Heat oven to 400°F; place large rimmed cookie sheet in oven to preheat. Spread fries on one half of cookie sheet; prick crust several times on bottom and side, and place on other half of cookie sheet. Bake 8 to 10 minutes or until lightly browned. Remove crust from oven, leaving fries and cookie sheet in oven. Meanwhile, in 10-inch skillet, cook beef and onion over medium heat, stirring occasionally, until beef is brown; drain. Stir in ketchup and 1 cup of the cheese. Spoon into crust, and top with remaining 1/4 cup cheese. Place pie back in oven on cookie sheet. Bake 25 to 30 minutes or until cheese is melted and fries are crispy; stir fries midway through baking. Cover pie loosely with sheet of foil after first 15 minutes of baking. Remove cookie sheet from oven, and top pie with fries. Serve immediately. 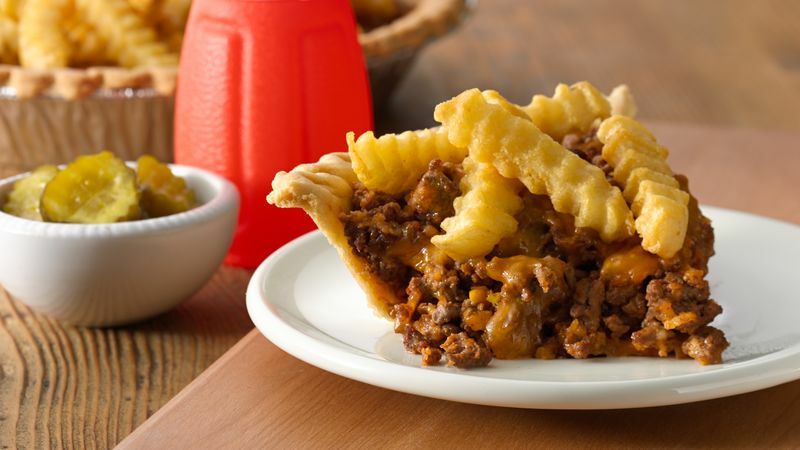 Transform your pie by adding crumbled cooked bacon. Experiment with variations of cheese as you like, for example, pepper Jack, Swiss, American. Garnish with a side of dill pickles, ketchup and mustard.